Go Sweeney for this Summer! Home > Blog > Go Sweeney for this Summer! Everything Summer Camp is proud as well as thrilled to be working with over 270 summer camps across the nation and we’re happy to sing their praises just as often as we can. This Blog is the perfect venue to highlight these awesome places that give kids a summer escape away into the wilderness where kids discover themselves and their true potential. And today, we swing our Summer Camp Spotlight down south to Texas where we find Camp Sweeney. Situated in the Lone Star State, just below the southern perimeter of Oklahoma, Camp Sweeney has been rooted in these southern grounds since 1950 where they have continued summer after summer to show their campers an absolutely awesome time for their summer stay! The people at Camp Sweeney know how drastically the diagnosis of Type 1 diabetes can flip our lives around. This is a camp where having Type 1 diabetes doesn’t make you an outcast; it makes you just like everyone else. Managing diabetes takes children away from their perception of ‘normal’, but not at Camp Sweeney. And after nineteen days of blood tests, insulin injections, and carbohydrate calculations bring the disappearance of diabetes, Sweeney campers can take pride in the knowledge that they possess the ability of overcoming this adversity. Nineteen days may seem like a lengthy stay to some camp families, but Camp Sweeney insists this length is necessary to form healthy habits, instill confidence, and develop friendships. Of course, campers are also treated to the typical fun activities that pack the days at any other summer camp. Sweeney campers can participate in awesome activities like Archery, Basketball, Challenge Course, Cross Country, Dance, Football, Frisbee Golf, Ultimate Frisbee, Hiking, Lacrosse, Mini Golf, Paintball, Riflery, Rock Climbing, Rocketry, Soccer, Tennis, Tumbling, Volleyball, Weightlifting, Zumba, and more! Have fun in the water too with their impressive Water Park or go Boating, Canoeing, Fishing, and simple Swimming! Quieter, indoor activities include Arts & Crafts. Broadcasting, Music, and Video Production. More than just a fun summer escape, Camp Sweeney is no ordinary camp; it’s a lifestyle. It’s a place where campers are taught not only how to manage their diabetes, but also motivated to do so. Sweeney campers return home with a renewed and deeper sense of self. 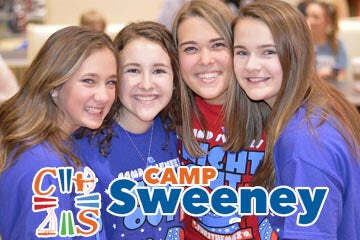 Give your camper this opportunity and send them to Camp Sweeney this summer! Check out their website for yourself by clicking here and, as always, thanks for reading.